The Radiation Alert® Area Monitor is one of the most user-friendly, all-inclusive, and state-of-the-art radiation area monitors available. The easy to use interface is an intelligent resistive touch screen display featuring a large five digit LED readout. It comes with either an internal or external detector and free software for monitoring every Radiation Alert® Area Monitor on your network. Includes user selectable warning indicators for low and high radiation alarm levels, low battery, and detector failure. All the settings are stored internally, even when power is disconnected. All units come with a Certificate of Conformance. NIST Source calibrations available upon request. 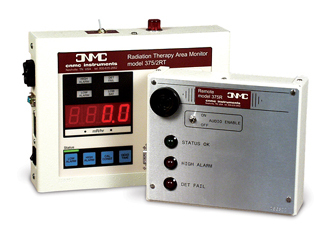 The Model 7008 R/T is a wall-mounted radiation monitor designed to meet the specific needs of radiation therapy. It is designed to operate continuously from an AC power line. In the event of power failure, the built-in, continuously trickle charged NiMH battery automatically switches in to begin supplying power immediately, assuring interruption-free operation at all times. The monitor features a digital display of radiation rate, audible and visual alarms, and alarm indicator, alarm setpoint adjustability over the entire range, and self diagnostic functions such as low battery, over range, detector saturation and detector failure conditions. A green status light is a positive indication of normal instrument operation. The optional Model 7008 R remote alarm unit duplicates the alarm indication functions of the main unit It features a green status light, a red light for high alarm, and Sonalert for audible alarm with a disable switch. It is supplied with a 50-foot cable. The Model 375/2RT is a wall-mounted radiation monitor designed to meet the specific needs of radiation therapy. It is designed to operate continuously from an AC power line. In the event of power failure, the built-in, continuously trickle-charged lead acid battery automatically switches in to begin supplying power immediately, assuring interruption-free operation at all times. 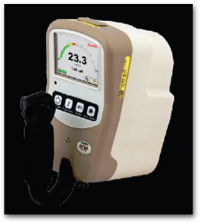 The monitor features a dual range digital display of radiation rate, audible and visual alarms, low alarm and high alarm indicators, alarm setpoint adjustability over the entire range and self-diagnostic functions such as low battery, overrange, detector saturation and detector failure conditions. A green status light is a positive indication of normal instrument operation. A flashing red light with a 180° visibility and a red LED indicator next to the digital display provide the visual alarm. The audible alarm (which may be disabled with a switch) consists of a single short beep at the beginning of the alarm mode. Optional features include SI units and 220V operation. The optional Model 375R remote alarm unit duplicates the alarm indication functions of the main unit at a remote location up to 1000 feet away. It features a green status light, a red light for high alarm and Sonalert for audible alarm with a disable switch. The remote unit is powered by the monitor. It is supplied with a 50-foot cable that carries both signals and power. The Primalert™10 is a compact monitor that responds to scattered radiation and can be mounted anywhere in the teletherapy room. A pair of bright red lamps on the instrument face flash a warning when the source is exposed, and they continue to flash until safe conditions are re-established. The flashing green operator indicator light continuously monitors the background radiation and provides a visible indication that the instrument is functioning. The monitor is supplied with a self-stick bracket for wall mounting. 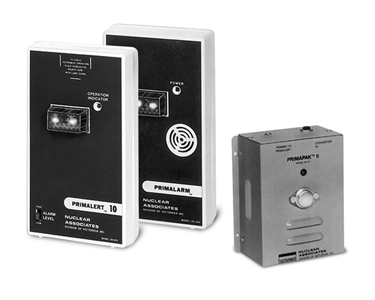 The Primalarm™ is a slave unit that allows the Primalert™10 signal output to be duplicated up to 100 feet away. The Primalarm™ also serves as an additional safeguard; it will flash if power to the Primalert™ is lost or if the cable from the latter is disconnected. 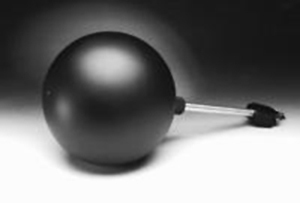 The Primalarm™ is ideal for mounting outside the therapy room entrance. To satisfy NRC requirements, the Primalert™10 must be used with the PrimaPak™II. The unit consists of rechargeable gel cells and circuitry that switches any Primalert to battery operation if line power is lost. When AC power is present, the battery is automatically recharged. Fully-charged cells provide about 8 hours of operation under alarm conditions or more than 32 hours of quiescent, no-alarm operation. This package also includes a 115VAC UL-listed wall-mount transformer and interconnect cable. 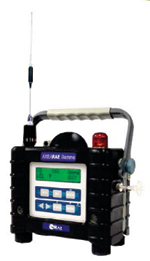 The AreaRAE Gamma is a combination multi-gas and radiation detector equipped with a wireless RF (radio-frequency) modem that allows the unit to communicate and transmit sensor and other information in real-time to a remotely located base controller. This rugged, weather resistant area monitor is portable and can operate up to 18 hours on rechargeable Lithium-ion cells or optional alkaline batteries. It is also the first “lunchbox" type multiple sensor instrument able to include a gamma radiation detector, a photo-ionization detector (PID) for parts-per-million measurement of volatile organic compounds (VOCs), as well as an LEL combustible gas sensor, oxygen sensor, and a selectable electrochemical toxic sensor. A personal computer can be used as the base station. The standard ProRAE Remote software used to control AreaRAE Gamma systems is capable of monitoring the input of up to 64 remotely located monitor. The UCS30 nuclear spectrometer offers many enhancements and additional features for increased flexibility. USB connectivity provides plug and play operation with most computers running Windows op systems. Three models are available with 1024, 2048 and 4096 channels of conversion gain. The internal preamplifier allows direct connection to scintillation detectors. The bipolar amplifier includes polarity selection and multiple shaping times when using different types of detectors with external preamplifiers. Upper and lower level discriminators may be set for rejection of unwanted signals. The high voltage supply is rated to +2048V for use with scintillation or proportional detectors. Optional polarity selection is available for use with detectors requiring negative bias. A preamplifier power connector (±12V) is included for use with our model PA-1 external preamplifier. A 10µs fixed conversion ADC allows high throughput with deadtime correction. Input selection for preamplifier, amplifier or ADC direct is included by computer control. Detects low intensity beta, gamma, and x-rays. Accurate detection of signals against background. 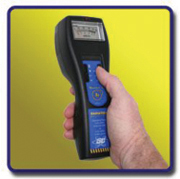 QUART didoSVM survey meter, rechargeable USB cable, manual and transport case. 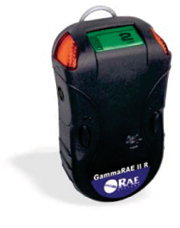 The GammaRAE II R is a gamma radiation detector and full-range dosimeter in a single instrument. 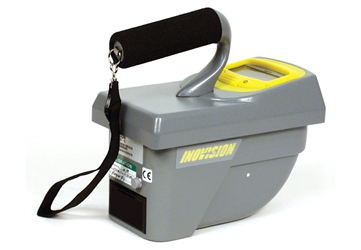 Designed specifically to meet the needs of first responders, it has the rapid response of a detector and the accurate dose measurement of a dosimeter. 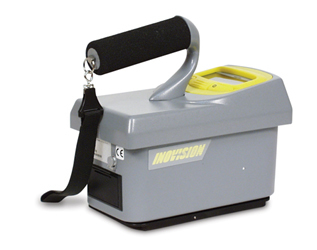 Sensitive CsI scintillator for excellent search capability and fast response. Energy-compensated PIN diode sensor for high dose rate range and accurate dosimeter capabilities. Prominent visible, audible and vibration alarms. Alerts first responders to radioactive threats. Accurately measures accumulated dose to the wearer. Immersible in water for easy decontamination. Continuous digital readout in Rem/hour (µR/h & mR/h) or in Sievert/hour (µSv/h & mSv/h) and counts per second (cps). Two operation keys, simple intuitive programming. Two AA alkaline batteries last up to 600 hours. Large, 30,000-point data log capacity, downloaded via cable free Bluetooth® connection. NeutronRAE II is the first personal radiation detector to provide rapid detection of both gamma and neutron radiation sources even in potentially flammable environments. 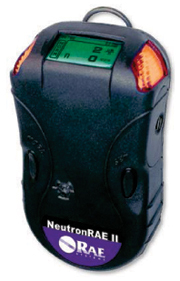 Certified intrinsically safe and water immersible for chemical decontamination purposes, the NeutronRAE II can be safely used in more environments than any other personal gamma and neutron radiation detector. The sensitive Cesium Iodide (CsI) gamma scintillator and Lithium Iodide (LiI) neutron scintillator of the NeutronRAE II provide a fast response to radiological threats. NeutronRAE II alerts the wearer with a loud audible buzzer, big, bright flashing LEDs, and a built-in vibration alarm. For stealth operations, users can disable each alarm individually. Immersible (IP67) design makes for reliable operation in wet environments and easy decontamination. The NeutronRAE II accumulates approximate total dose from gamma radiation. Stored dose data can be cumulative or cleared and reset for each use period. IS certification permits operation in potentially flammable/ explosive environments. Monitor 4: Halogen-quenched uncompensated GM tube with thin mica window 1.5-2.0 mg/cm² thick. Monitor 4EC: Halogen-quenched GM tube, energy compensated sidewall 2mm tin filter. Thin mica window 1.5-2.0 mg/cm² thick. Analog Meter holds full scale in fields as high as 100X maximum reading. CPM & mR/hr scale. Optional SI Scale Meter Available. 1000 CPM/mR/hr (Cs137). 4EC is the same as M4 except the energy response for gamma and X-rays through the detector sidewall is flat within +61% or -26% over the range of 40 keV to 100 keV, and within +35% or -17% over the range of 100 keV to 1.3 MeV. 0-0.5, 0-5, 0-50 mR/hr 0-500, 0-5,000, 0-50,000 CPM or 0-5, 0-50, 0-500 µSv/hr (SI Scale Meter Option). X1, X10, X100, Battery Check. Typically ±15% of reading (Cs137). The ASM-990 survey meter is an easy-to-use instrument that detects alpha, beta, gamma, neutron or X-ray radiation within an operating range of 1 µR/h to 1 R/h or 1 CPM to 5,000,000 CPM, depending on the probe selection. Visual indication of measured values and selectable parameters is displayed on the analog/digital display. The Survey Mode feature allows the user to store up to 5 separate sequences. The ASM-990 is compatible with Geiger-Mueller (G-M) detectors, neutron probes, proportional counters and scintillation probes operating from 500 to 1300 volts. The ASM-990 is designed to meet high technology requirements of health physics, medical physics, and non-destructive testing applications. Radiation safety officers (RSOs), nuclear medicine laboratories, diagnostic X-ray and hospital emergency room technologists, and environmental health physicists will appreciate this intelligent survey meter with its cell-phone-like multifunction key for easy menu navigation. 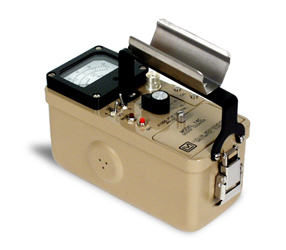 The ASM-990 includes a natural uranium check source mounted to the case of the unit. The unit is supplied with a MHV connector to ensure compatibility with a large number of probes. The ASM-990, with a purchased probe, is shipped calibrated and ready-to-use. The Model 14C survey meter features an internal energy compensated detector with a 0-2000mR/h range to satisfy the 1R/h requirement for Nuclear Medicine departments. It has a connector for external GM and scintillation probes for contamination surveys and searching for lost seed sources. A built-in Unimorph speaker provides an audible indication of changing radiation rates. Scintillation probes exhibit greater sensitivity than Geiger-Mueller probes. The ability to detect a radiation source from a greater distance makes them useful for searching for misplaced radioactive sources. 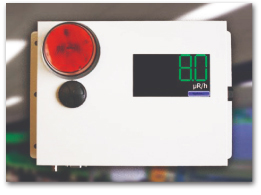 The Model 12-4 consists of a count rate meter with a removable detector. The detector assembly consists of a 1.6cm by 2.5cm BF3 proportional tube, surrounded by 0.0038cm (0.0015") thick cadmium shield, within a 22.9cm (9") diameter polyethylene moderator. This assembly provides an approximate inverse RPG response curve for neutrons ranging from thermal through 10MeV. Efficiency for AmBe neutrons is approximately 30cpm/mrem/h. Gamma sensitivity at Cesium-137 is less than 10cpm through 10R/h. 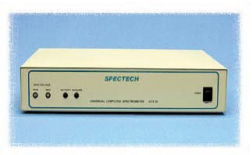 The Model 15 is designed to detect alpha, beta, gamma and neutron radiation. It consists of a count rate meter with a removable thin-end window alpha, beta gamma probe and a BF-3 neutron proportional tube detector with a 3" diameter cadmium-lined moderator. The detector can be removed from the moderator for fast neutron response. 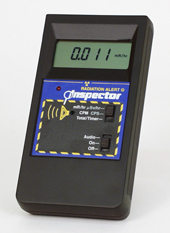 The Inspector is a microprocessor-controlled radiation detection GM tube-based instrument offering good sensitivity, digital readout for accuracy and with a bar graph that indicates trends, an audible indication of changing radiation rates and a user-adjustable timer for sampling periods. The Inspector’s small size and built-in pancake detector configuration makes it inconspicuous and non-intimidating when used in the presence of patients. In the laboratory, it conveniently checks for contamination of tabletops, clothing, equipment, etc. The microprocessor automatically compensates for GM tube deadtime in mR/h. One 9-volt alkaline battery provides long battery life and reduces the chances of battery leakage. 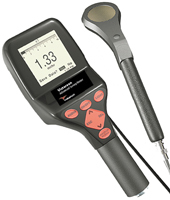 Over the years, individual manufacturers of Geiger-Mueller-type survey meters have adopted various connectors to mate their handheld detector probes with their readout units. 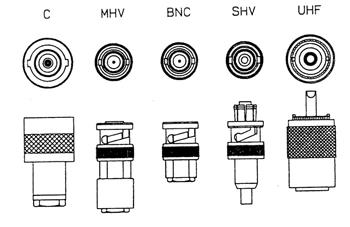 The above drawing shows outlines of the most common cable connectors used in the industry. To order a cable that mates a probe to an instrument having a dissimilar or identical connector, chose a connector for each end and refer to the table on the right. Also available are bulkhead (panel mount) connectors that are mounted on the instrument case or on the detector probe. Drawings are shown to help with positive identification of the mating cable connector. 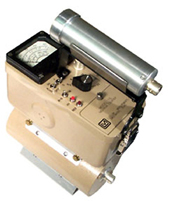 Ludlum Measurements Inc. supplies connector type C on survey meters and probes, with the appropriate cable if no preference is given at the time of the order. 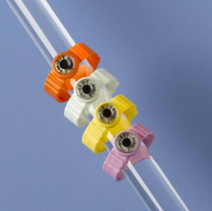 MHV, BNC, SHV and UHF connectors with appropriate cables are available as options. Victoreen, Inc. supplies survey meters with MHV connectors exclusively, Model 190 being the only exception, offering BNC as an option. The table below identifies probes with integral connectors that can be used with the above cables, and integral cables that can be converted using an adapter. Alarms — Two levels of radiation alarms available, each are user programmable throughout entire readout range and set through a PC interface program. Other alarms include low battery and various detector failures. The Model 451B® is the successor to the highly successful Model 450B® rugged, light-weight portable survey meter featuring a thin window ionization chamber with a sliding beta shield, microprocessor technology and an auto-on backlit analog/digital liquid crystal display. The ionization chamber has a thin mylar window for excellent low-energy X-ray response and detection of alpha and beta particles. The window is protected by a stainless steel mesh and a beta slide that provides buildup. It is simple to operate; only ON/OFF and MODE buttons are needed because the microprocessor controls both auto-ranging and auto-zeroing. The display of the 451B® is unique: the 2-1/2 digit display provides reading accuracy for shielding studies while the 100 element analog bar graph, with a faster time constant, makes the instrument ideal for surveying changing radiation levels. The integrate (dose) mode registers scatter doses from the shortest radiographic exposures. Integration begins 30 seconds after the instrument has been turned on and it operates continuously even while in the rate mode. Just press the MODE button to switch to integrate and read the dose that has accumulated during the survey. The RS-232 interface used with Excel add-in for Windows® allows for data retrieval and user parameter selection while providing virtual instrument display. The rugged case is sealed against moisture and is available in red/yellow/red (RYR suffix). The 451B® is also available in Dose Equivalent SI units (specify DE-SI suffix). The Model 451P® is a revised version of the highly successful Model 450P® survey meter, featuring a pressurized ionization chamber, microprocessor technology and an illuminated analog/ digital liquid crystal display. The ionization chamber is filled with argon to a pressure of six atmospheres. This greatly improves the sensitivity to low levels of radiation, enhances low energy response, reduces time constant and makes it air density independent. Its ability to read low levels of radiation is 10 times greater than similar non-pressurized ion chamber type survey meters. The 451P® is simple to operate; only ON/OFF and MODE buttons are needed because the microprocessor controls both auto-ranging and auto-zeroing. The display of the 451P® is unique: the 2-1/2 digit display provides reading accuracy for shielding studies while the 100 element analog bar graph, with a faster time constant, makes the instrument ideal for surveying changing radiation levels. The integrate (dose) mode registers scatter doses from the shortest radiographic exposures. Integration begins 30 seconds after the instrument has been turned on and the 451P® operates continuously even while in the rate mode. Just press the MODE button to switch to integrate and read the dose that has accumulated during the survey. An RS-232 interface, used with Excel add-in for Windows®, allows for data retrieval and user parameter selection while providing virtual instrument display. The rugged case is sealed against moisture and is available in red/yellow/red (RYR suffix). The 451P® is also available in Dose Equivalent SI units (specify DE-SI suffix). These low-level, spherical ionization chambers are particularly useful whenever it is necessary to accurately evaluate weak radiation fields, providing dependable service as low level area monitors and in conducting surveys. When used with a sensitive electrometer, ionization currents resulting from natural background radiation are easily measured. The rigid stem provides a convenient means of mounting the chamber. 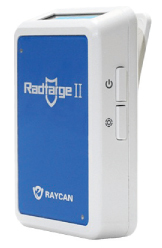 RadTarge II | Electronic Personal Dosimeter uses a YSO scintillation detector combined with a state-of-the-art silicon photomultiplier (YSO+SiPM) and multi-voltage threshold (MVT) algorithm to detect a wide range of radiation doses. DOSEi is a small and lightweight electronic personal dosimeter which is easy to use. Measures dose and dose rate. Water and noise resistant enables high reliability. Easy-to-read organic EL display and various alarm functions. Settings are possible in one unit. CAUTION! Read the instruction manual provided before using this product, to make sure you operate it safely. Specifications are subject to change without notice. The Thermo Scientific EPD Mk2+ builds upon the high performance of the original MK2 design, while providing enhanced features. The EPD Mk2+ is suitable for use as a single, stand-alone dosimeter, or as a component of a comprehensive dosimetry management system using our renowned hardware and software packages. The high quality of the Mk2+ provides low lifetime costs as well as advanced radiological performance. The Thermo Scientific Mk2+ electronic personal dosimeter is perfect for organizations, utilities, agencies, and research laboratories to monitor employee dose and dose rates. The Mk2+ also boasts a ruggedized battery cap and an improved display. The unit is powered by a single standard AA cell, either 1.5V alkaline or 3.6V Lithium Thionyl Chloride for maximum battery life. Pre-use integrity checks may be initiated over the IR (Infra-Red) communications link as part of the EPD Issue process of access control or dosimetry management systems. These checks include detector tests, battery test and battery voltage read. Display and function are controlled by a single button on the front of the unit, recessed to prevent inadvertent operation. DoseRAE Pro is a rugged, compact, direct-reading and alarming electronic personal radiation detector and dosimeter. It uses a diode and a scintillation crystal to detect X-ray and gamma radiation, and provides real-time monitoring of personal dose and dose-rate, allowing immediate action to reduce personal radiation exposure. DoseRAE Pro includes a Stay-time countdown timer with a warning alarm to allow the user to set a specific time limit when working in a radiation area, limiting the user’s personal radiation exposure. Rugged electronic dosimeter with high sensitivity CsI Scintillator sensor. Multiple units with reader and software can be used as a dosimetry system. Continuous LCD digital dose rate readout in Sv/h or R/h. Continuously accumulated total dose readout in Sv or R.
Prominent visible, audible, and vibration alarms. User configurable Stay-Time countdown timer and alarms to prevent excessive radiation exposure. Fast near field communication wireless data transfer. Simple two button operation and programming. 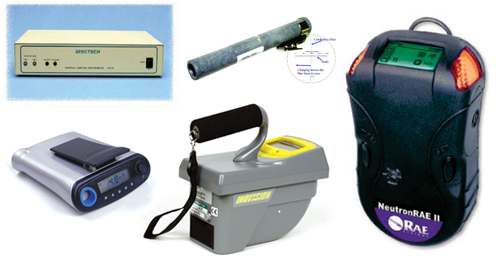 A whole body dosimeter for occupationally exposed radiation workers based on well-established TLD technology. Accurately determines deep, shallow and lens of the eye radiation dose over a broad range of photon energies. An extremity ring dosimeter for occupationally exposed radiation workers based on well-established TLD technology. Accurately determines shallow radiation dose over a broad range of photon and beta energies. 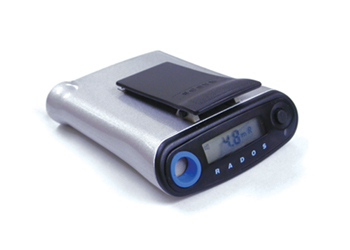 The RAD-60 personal dosimeter is an extremely compact, solid-state electronic device utilizing a high-performance, energy-compensated silicon diode to measure dose and dose rate in real time. 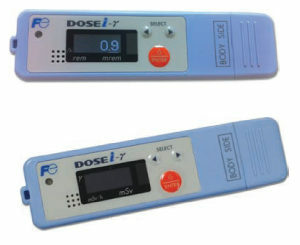 It features an audible alarm that alerts the user immediately that a preset dose or dose rate level has been reached. Dose rate may be monitored by an audible chirping function that can be disabled with a switch. A single front panel push button provides the following functions: power on/off, chirp on/off, dose/dose rate, integrated dose reset, alarm threshold change and battery check. A single, easily obtainable AAA alkaline battery supplies power for approximately 1800 hours at background levels in dose mode. These direct reading dosimeters allow the wearer to read accumulated radiation exposure at any given time without a separate readout device. The integrated exposure is read on a built-in scale that is illuminated by an external light source. 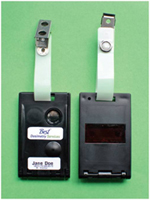 A film badge cannot provide an immediate answer if an overexposure has taken place, but a wearer of a direct reading dosimeter can tell when, where and whether the overexposure took place and hazardous conditions can be corrected long before film badge readings can be known. 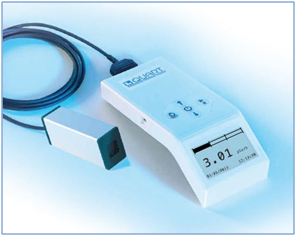 The low energy feature of these dosimeters have hospital applications in fluoroscopy, portable radiography, angiography and mammography. These dosimeters may be reused repeatedly by resetting to zero with the Model 909 dosimeter charger after the accumulated exposure has been recorded in a log. This dosimeter charger zeroes all direct-reading dosimeters. One standard 1.5V D cell permits thousands of chargings. A safety spring in the charging socket prevents damage to dosimeter in event that excessive force is applied during charging. A protective cap keeps the socket free of dust and moisture when charger is not in use. The Multi-Dosimeter Checker allows the simultaneous testing of up to five direct reading dosimeters. It consists of a plastic cylinder that has five holes around a central, hermetically-sealed Ci-9m Cesium-137 source. The procedure for checking dosimeters is very simple. Properly charged and zeroed dosimeters are placed in the cylinder and exposed for the required period of time, depending on their range. 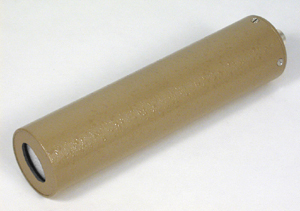 Typically, a six-hour exposure of a properly-calibrated dosimeter will yield a reading from 25 to 35 mR.
Three standard sizes of lead foil are available in 14" wide rolls. They can be easily cut and formed into almost any shape for shielding areas, parts of areas or objects of all types, offering great convenience if kept on hand. 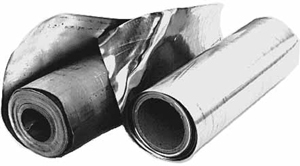 Sheet lead has numerous applications in building radiation protection systems. It is certified to meet federal specification QQ-L-201F. Sheet lead is available in a wide range of uniform thicknesses from 1/64" (1 lb/ft²) up to 4" (240 lb/ft²). Widths up to 8 feet and lengths up to 25 feet are available in rolled or flat forms. Call us with your particular design requirements as custom sizes of sheet lead are available upon request.